Ethan Saks, Becca Ballenger, Katrina Ferguson, and Pedro Carmo in Absolution. BOTTOM LINE: Absolution is a fast-paced exploration of the power exchange between two generations of investment bankers, though its writing is more style than substance. Greed: it’s perhaps the most dangerous of the seven deadly sins, as it’s also the most seductive. And while this seduction can be thrilling, it can also be complicated -- and, sometimes, even downright dirty. Playwright Christopher B. Latro explores this darker side of greed in Absolution, his new play now running at St. Luke’s Theatre. While Latro’s play certainly reads as a critique of American consumerism and a cutthroat Wall Street culture, his writing lacks the dramatic tension and finesse necessary to transform this critique into anything particularly adept. His characters, for example, are so woefully one-dimensional that it’s difficult to accept them as anything other than comically broad Wall Street stereotypes, thereby hampering any commentary on the complexities of their destructive attitudes and actions. Likewise, Anna Bamberger’s direction is of little help in injecting a pulse into Latro’s script; all too often, this production is lacking an urgency and a drive that should seem commonplace in a play set within the high-stakes world of investment banking. Fortunately, this production is aided by its capable company of performers, who do their best to avoid drawing caricatures of their characters. 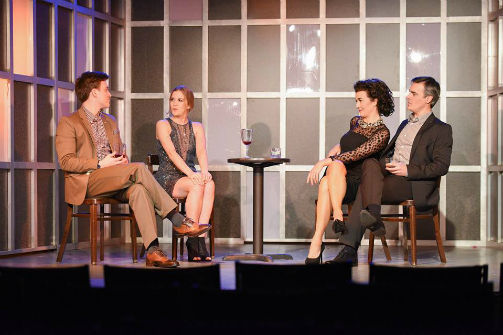 Becca Ballenger delivers a particularly noteworthy comedic performance as Marie, Ethan’s social-climbing fiancé, and Saks makes an impressively grounded off Broadway debut as the young, ambitious Ethan. The opulent world of Latro’s script is best communicated by the production’s design; Lauren Mills’ scenery does an impressive job at transforming into a variety of lavish spaces with minimal tweaking, and Michael Alan Stein’s costumes are the strongest visual cue of the characters’ high-powered socioeconomic status. Absolution isn’t a bad play, and I applaud Latro for making a theatrical effort to explore and criticize the complex and complicated world of investment banking. As it stands now, however, Absolution is less of a critique of American capitalism, and more a lackluster case study of what can happen when our personal and professional paths cross far too quickly -- and far too often.